I've been playing around with different techniques, and today's card features one of those! 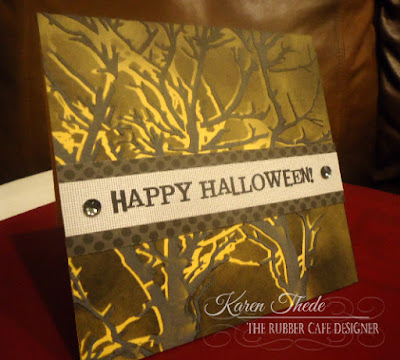 This combines, stencils, distress ink, and textured modeling paste to create the fabulously spooky background of my card! Topping it off with the Happy Halloween phrase from the stamp set in this month's Creative Cafe' kit- was all my card really needed. First, here's a quick look at my finished 5x5 card! I'm sorry - I don't have better step by step pictures but during the creation of this card, my battery was still re-charging so I'll have to talk you through some of the steps. Using a low-tack tape; I have green froggy tape used for taping off edges for painting. It stays down well w/o leaking and stays put until you need to remove it. 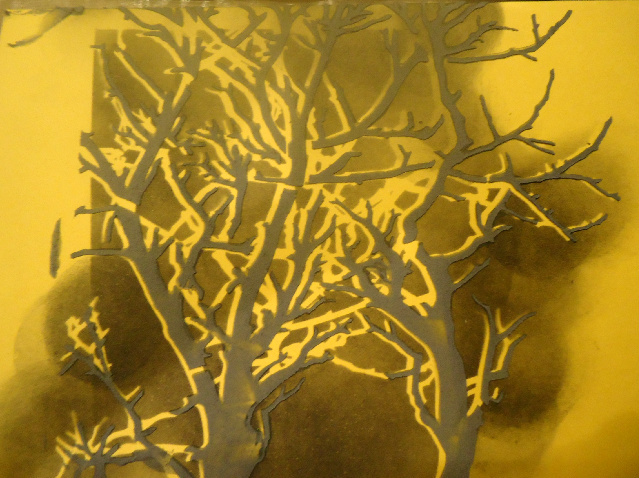 I taped down the Positive version of my Tree branch stencil; this means that the tree itself is available to ink around leaving yellow-card stock where the tree stencil was - and showing the black soot shadows created all around the tree. Next I colored my white paste and mixed it with Black Soot ink. I got a nice grey shade that I thought created a perfect contrast to the black soot ink. Peeling back the stencil this is what you will see in my picture below. Here I've trimmed my card front back to a 5x5 size- I took another yellow cardstock cut at 5 x 10 and scored at 5" - to create my card. This was than adhered onto that. 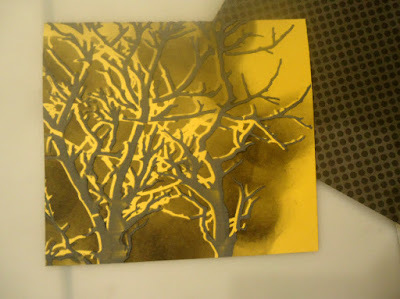 I wanted to put a phrase to the inside of my card, by stamping in Black Tuxedo Memento Ink directly on the yellow cardstock. As you can see in my image below - I had a stamping emergency as some of the ink created a line at the end of the broom handle and the at the broom bristle part. Have no fear! There are ways around these things...if it had been on white cardstock I could have used my white gel pen to hide those mistake streaks of ink not intended for my finished card. 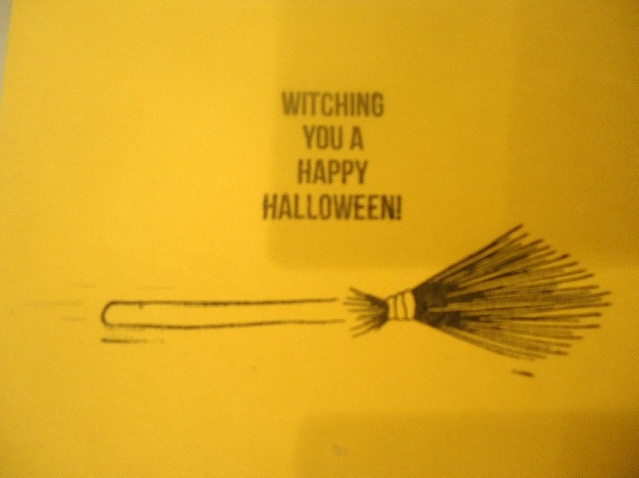 But being on yellow cardstock, I had to come up with an alternative 'fix'. 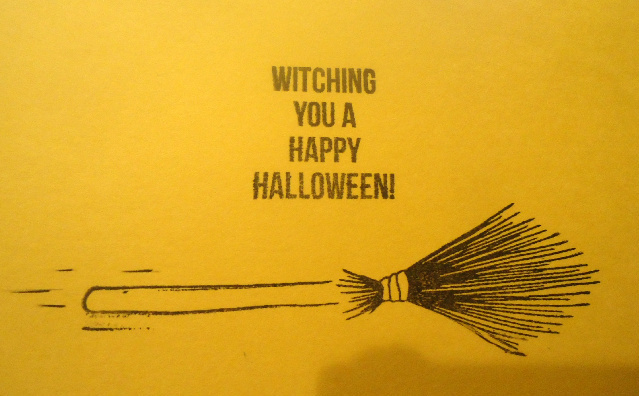 Taking my fine black pen - I created additional streaks of black to give my broom the look of motion as it flies through the air! On the broom bristle end I made that streak into another portion of the broom. 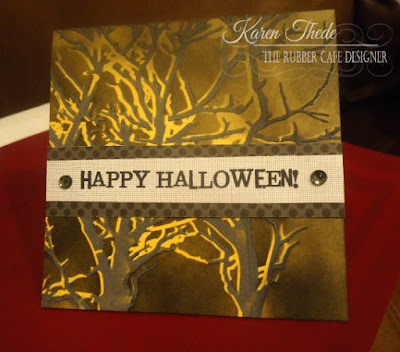 Finishing my card was simply a stamped Happy Halloween phrase, stamped on white cardstock and backed with patterned paper from the Doodlebug pad. I hope you'll give this technique a try - it's actually pretty easy to do and does not need much else but a simple phrase to finish off your card! Really cool technique. I'll have to try this!